Double-clicking Soxy‘s icon brings up the Soxy configuration screen. When you’re running a demo version of Soxy, you’ll first be presented with a ‘beg-dialog’ where you can click Get License… to initiate the procedure of purchasing a Soxy license. For now, click OK to get past the beg-dialog. In the left column you see a list of document main types that Soxy knows how to recognize. For each of them, the rightmost column either lists the application it would use to open that particular document type, or it shows the words Version-dependent. Click the disclosure triangle in front of a version-dependent file format to get more information. To change any of these, simply select the line by clicking it. 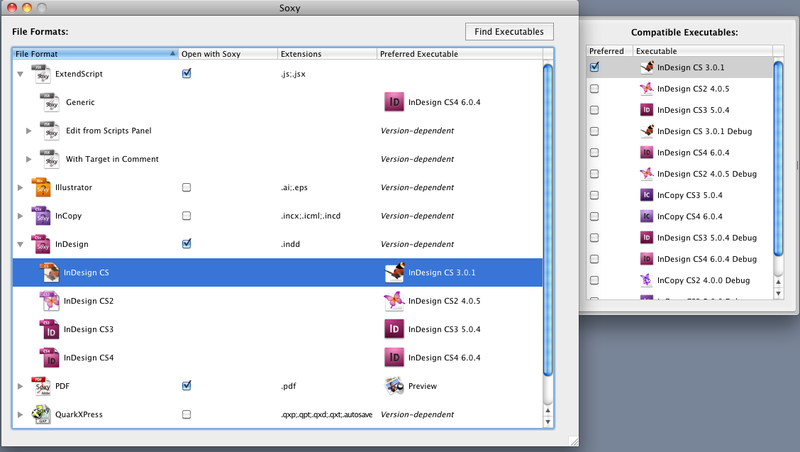 Soxy will show some of your installed applications – those that it thinks can open that particular document type. You choose amongst them by ticking the checkbox in front of the application you want Soxy to use. In the sample shown above, InDesign CS documents will currently be opening into InDesign CS, and I have a whole host of other InDesign versions on my computer that could also open these documents for me. Caveat: the Finder allows a user to override the system-wide Open With settings for individual document files. Such manually overridden document files won’t be ‘captured’ by Soxy. See further down, under Issues for more info. When Soxy is launched for the very first time, it will automatically scan your hard drive and try to find all interesting applications. That process takes a little while, and is fairly thorough, but it might still miss some applications. Also, you might install a new version of some supported application, some time after you already have installed Soxy. In those cases, where you don’t see an application listed in the main Soxy screen shown earlier, you will need click the Find Executables button in order to make Soxy re-scan your drive and add the missing application to the list of applications available. If desired, you can also remove some of the applications listed in case they are irrelevant to your particular workflow. This shows a list of applications that Soxy knows about. You can remove some of these by selecting the entry, and clicking the red ‘-‘ button. You can add additional applications by clicking the green ‘+’ button. 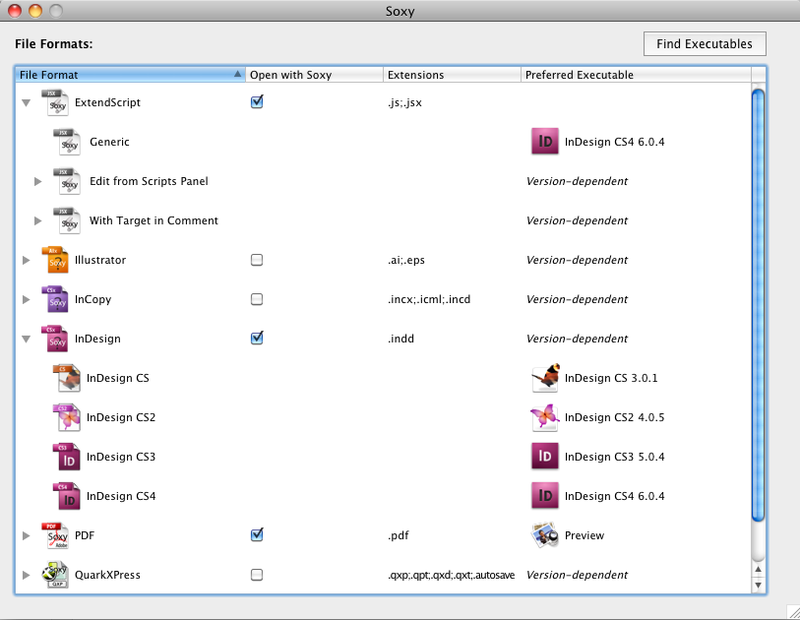 Under the File Formats tab you can see all File Formats that Soxy supports. Unchecking an Enable checkbox allows you to completely remove a particular file format from the main Soxy configuration screen. The Other tab has some rarely used settings – on the Other tab you’ll find a checkbox that allows you to turn off the automatic ‘icon correction’ feature in Soxy, for those rare cases where it interferes with file modification dates. Afterwards, using Soxy is easy: if you have ticked the checkbox in the Soxy window it handles the document type at hand, all you need to do is double-click the document.